The Care 2653 is designed with safety, beauty, and durability in mind. Perfectly sized for small bathrooms, it is an ideal choice for the typical American home. At American Tubs, your safety is our top priority. According to the The New York Times and The Center for Disease Control and Prevention, the bathroom is the most dangerous room in the house. Every year, an estimated 235,000 people over the age of 15 sustain injuries while in the bathroom. More than one-third of these injuries occur while individuals are bathing or showering. This number increases exponentially for persons over the age of 85. We have assembled your walk-in tub to prevent these injuries and mishaps. 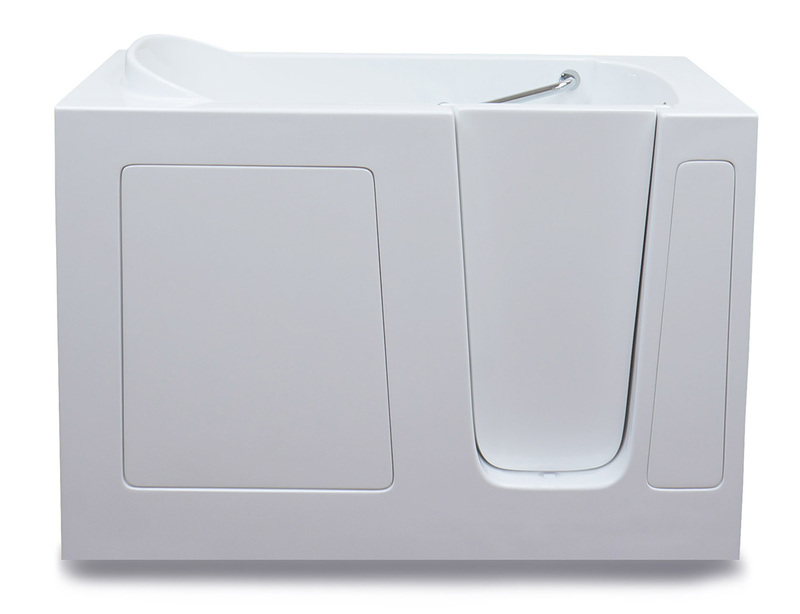 The Care 2653 has a V-shaped door that swings inward to allow for seamless accessibility into and out of your bathtub. This water tight door is also equipped with a secure locking system and an ergonomically designed door handle for easy grip. This model is designed with a low, 6″ threshold and 6 adjustable tub feet which ensure that this tub is both safe and user-friendly for individuals with mobility concerns. The textured, non slip floor adds extra security along with the integrated safety bar and fitted U-bar for balance and stability. We truly aim to design and manufacture walk-in tubs which alleviate worry and promote peace, enjoyment, and health for our customers. We manufacture our walk-in tubs to ensure a cost efficient, timely, and smooth installation process. The CARE 2653 is conveniently constructed to replace your existing bath tub or shower stall. To maintain the aesthetic of your bathroom décor, this model comes with an extension kit to perfectly fit a standard 60″ bath tub opening. The flangeless design of our walk-in tubs saves time, money, and worry as it helps to preserve your existing tile work. In addition, we offer an optional flange kit for new tile and surround which ensures that your walk-in tub remains water tight. The CARE 2653 measures 26(W) x 53(L) x 36(H), which means that there is plenty of room for you to adjust your water to a level that is right for you. Enjoy being abundantly embraced by soothing water as you soak away the day’s aches, stresses, and cares. In addition, you can enjoy this model’s 20.5″ contoured seat as you relax and bathe. With our Hydro and Air Massage options, we also fit your walk-in bath tub with an easy to use touch pad system with extra-large, domed, textured buttons which are backlit for your convenience. Not only do we aim to create a safe bathing experience for you, but we also aim to ensure that your walk-in bathtub enhances your lifestyle and brings you continual peace of mind. Quality is essential to us in the manufacture of our walk-in tubs. Therefore, the CARE 2653 is constructed with the highest quality materials on the market. 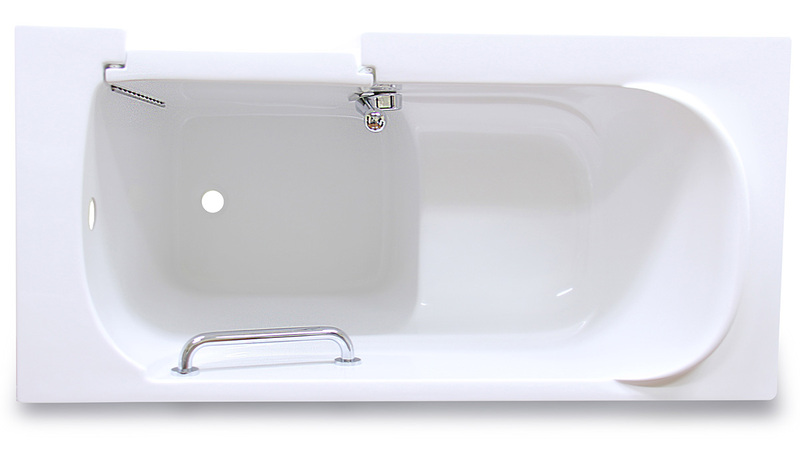 Made with a robust, one-piece steel frame of woven marine grade fiber glass, the CARE 2653 is much more resilient than a standard bath tub composed of inferior materials such as acrylic. We also use a triple gel coat finish which increases the strength and durability of your walk-in tub, as well as making it easier to clean, which is always an added asset. This walk-in tub comes with 6 levelling legs so not only can you adjust the tub according to your bathroom’s layout, but you can also adjust your tub to your desired height. This is an important feature for individuals with mobility concerns as it allows for ease of movement when entering and exiting the tub. In addition, to accompany the beauty of your bathroom’s existing interior, the CARE 2653 comes in either biscuit or white. These neutral colors match virtually any bathroom décor. You can be sure that you are investing in quality when you invest in a walk-in tub from American Tubs. We are pleased to offer you several stylish and ergonomically designed fixtures and fittings to complement your walk-in tub. The Care 2653 comes with an elegantly crafted, 5 piece, chrome plated faucet deck with solid brass construction. Designed with hot and cold water handles, this faucet deck also includes a useful diverter handle so that you may easily adjust your water temperature. Also included is an integrated showerhead which allows you to shower as well as bathe. 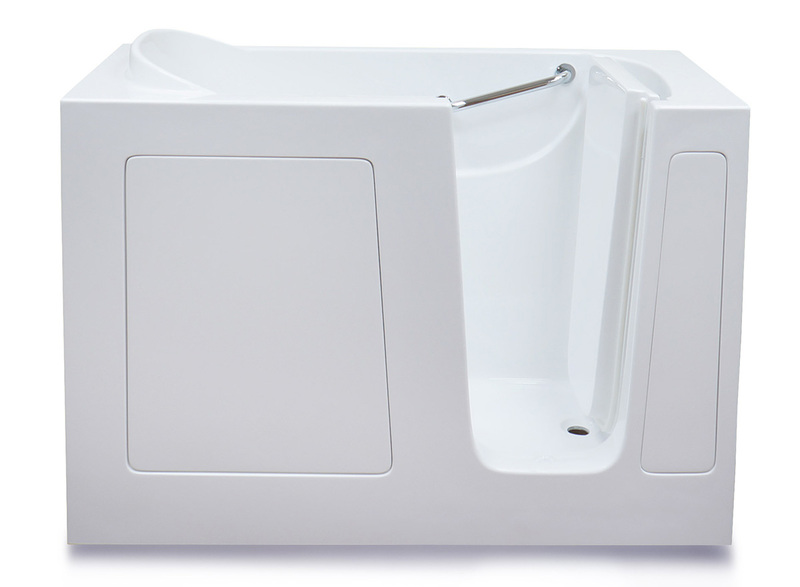 Each of our walk-in tubs comes equipped with a 1.5″ cable operated drain which makes draining your tub effortless. The integrated door drain keeps the door threshold free of excess and potentially hazardous water. To supplement the existing drain, most customers opt for our patented 2″ Hurry Drain which enables your tub to drain in roughly 110 seconds, depending on the water level and the efficiency of your household plumbing. To personalize and enhance your bathing experience, continue reading and discover more of the marvelous, optional features that are available for you. We understand that each of our customers has individual needs when it comes to bathing. Taking this into account, we offer several options which are practical, salubrious, and luxurious. Our Air Massage System is equipped with 20 state-of-the-art jets that target the thighs, calves, and the back of the knees, gently exfoliating the skin for improved circulation. This feature is significant particularly for individuals who suffer from diabetes or arthritis. Our Hydro Massage System uses 10 water jets to target the back, hips, knees, and the bottom of the feet in order to relieve muscle pain, joint pain, and stress. This feature uses a 1hp Syllent Pump which is whisper quiet and provides an eco-friendly way of heating your water while you bathe. Also available is Chroma and/or Aroma therapy, a neck and back pillow, a snugly fitted seat cushion to aid in your relaxation, and much more! Visit our features page to explore ways to create your own, perfect bathing experience, every time you bathe!